The Mercedarian Order was founded by Saint Peter Nolasco in 1218 for the purpose of ransoming Christian captives in the hands of the Moors. By 1272, Mercedarian legislators acknowledged their faith in the divine motherhood of Mary, in her perpetual virginity, in her coredemptive mediation and in her final glorification as they proclaimed her Glorious. 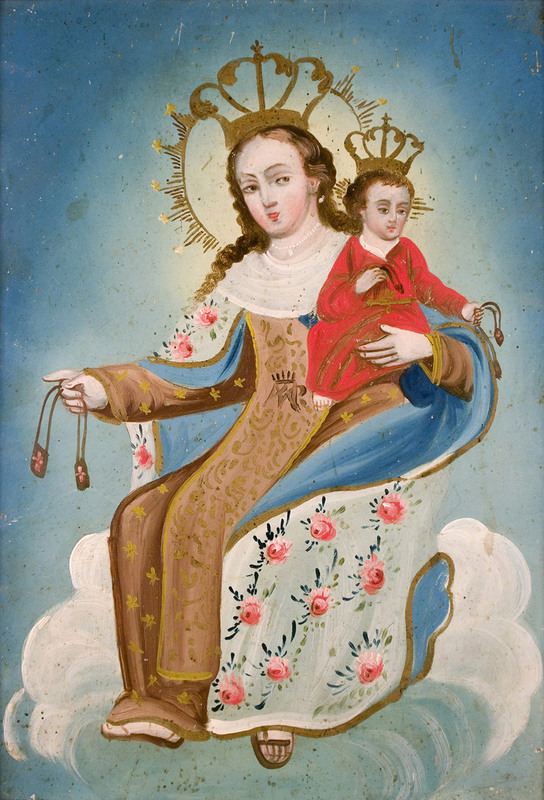 Our Lady of Mercy and the Christ child are both holding scapulars resembling the shield of the Mercedarian Order. The scapular is a part of the monastic habit, which is composed of two large pieces of cloth, connected in the middle by narrower strips of cloth. The narrower strips provide an opening through which the monk placed his head; the strips then sat on his shoulders, and the large pieces of cloth hung down in front and in back. The most famous of the small scapulars is the Scapular of Our Lady of Mount Carmel, the “Brown Scapular,” revealed by the Virgin herself to St. Simon Stock on July 16, 1251. Those who wear it faithfully as an expression of devotion to the Blessed Virgin Mary, it is said, will be granted the grace of final perseverance. In this retablo Mary is clothed in her blue cape and crowned to denote her royal status. She is clothed in the brown colors of the Mercedian order and on her gown is a stylized version of her royal ciphers. She appears in her traditional role as the protectress of the Child. Since the Mercedarian Order was founded for the purpose of ransoming Christian captives Our Lady of Mercy is often called upon by the enslaved.